Wingless Pterocomma salicis viviparae are greenish black to black with greyish white wax powder including a spinal stripe and lateral spots. There are marginal plates on all abdominal segments and pleurospinal plates on segments 7 and 8. The rostrum reaches to the hind coxae and the apical segment of the rostrum (RIV+V) is 0.8-0.9 times the length of the second hind tarsal segment. The siphunculi are bright red or orange and strongly swollen. 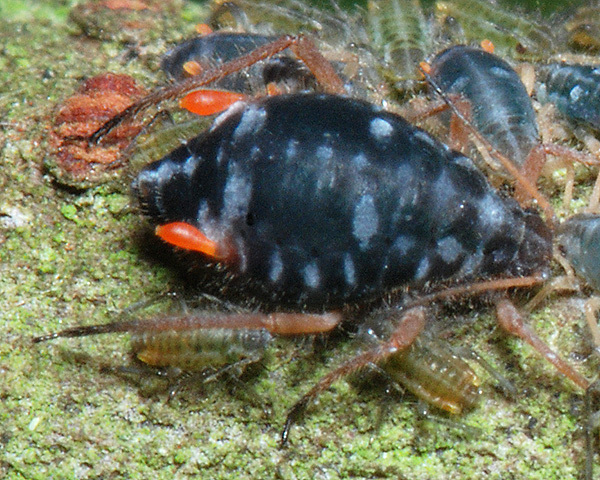 The body length of the adult apterous vivipara is 3.2-4.5 mm. Winged viviparae of Pterocomma salicis have the same pattern of abdominal plates as the wingless viviparae. The black willow bark aphid forms dense colonies on two-year-old twigs and wands of willow (Salix spp.). It is usually attended by ants. 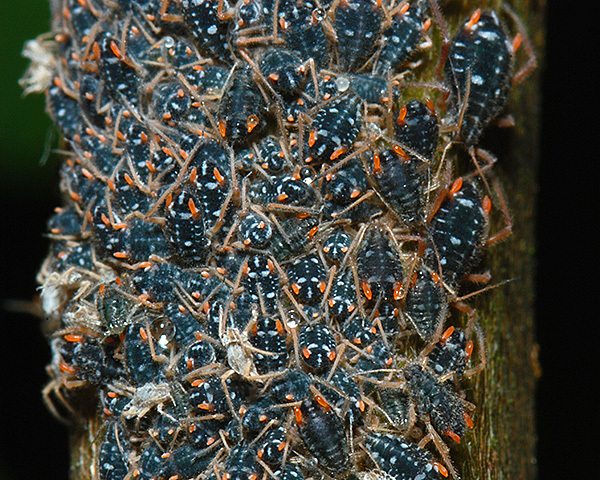 Apterous males and oviparae occur in October-November. Pterocomma salicis is widely distributed in Europe and Asia, and has been introduced into North America. The black, white and bright orange combination (see first picture below) is classic aposematic coloration - presumably intended to warn off potential predators. The bright orange pigment seems most-likely beta-carotene, since the bark of Salix has unusually high concentrations of this pigment. 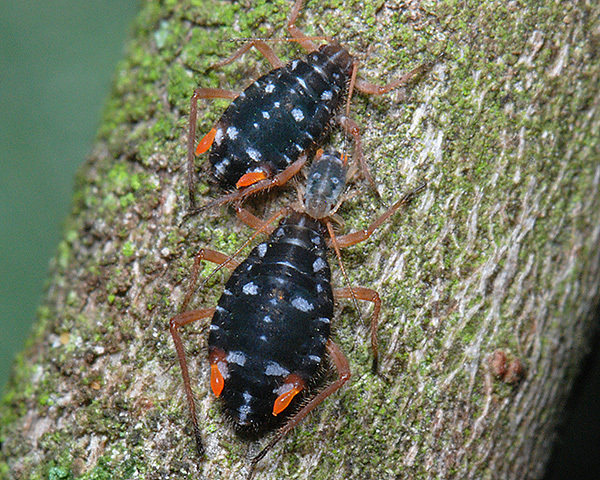 Whether Pterocomma salicis is distasteful to vertebrates, or whether it has evolved that coloration to mimic other distasteful insects is unknown. 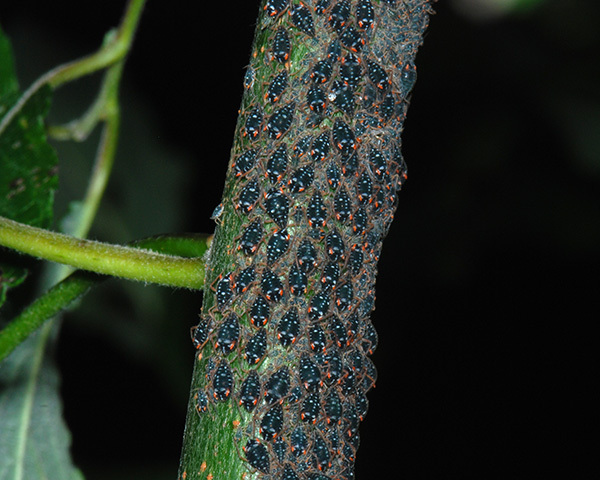 Interestingly the effect of having a large number of these aphids together (see picture below) is rather different. Now we realise that for large aggregations it could be a form of crypsis: either pattern blending on the bark, or disruptive coloration where blocks of highly contrasting coloration on each prey prevent a predator from detecting or recognizing the preys outline (Caro, 2009). We suggested something similar for Tuberolachnus salignus in our August blog. Pterocomma salicis often forms mixed-species colonies on the bark with the cryptic Pterocomma pilosum. 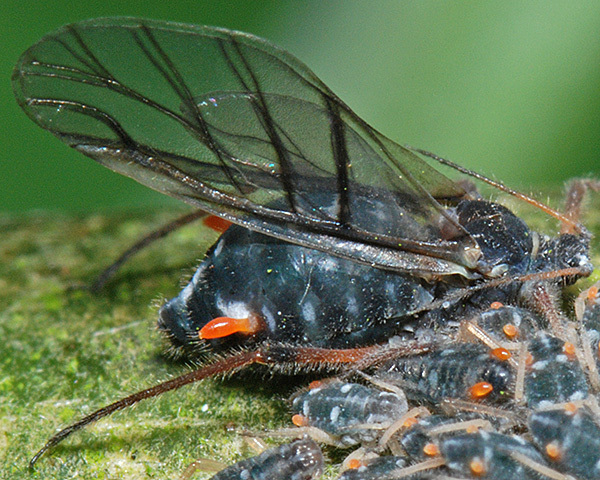 The consequences of mixed species colonies for the visibility of the aphids to predators is intriguing. We discuss this more in our aphid colour page. Pterocomma salicis does not seem to readily form mixed colonies with Pterocomma rufipes, although our lack of records may simply reflect the greater scarcity of Pterocomma rufipes relative to Pterocomma pilosum. Since they often form mixed colonies with Pterocomma pilosum, it is not surprising these aphids share the same ant attendants. The pictures below show southern wood ants attending Pterocomma salicis. 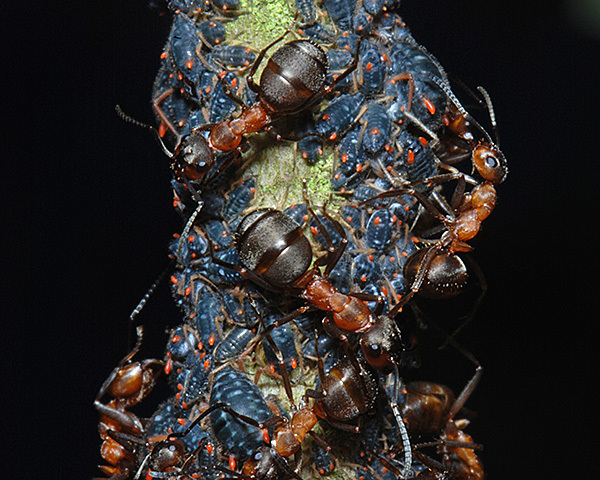 Molnar et al., (2000) studied attendance of willow aphids (Chaitophorus and Pterocomma species) by ants. 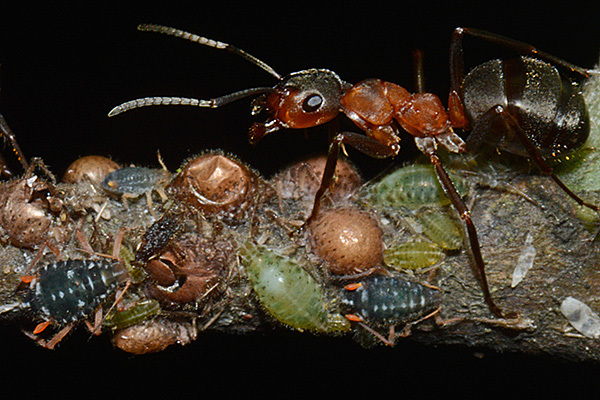 They found the mutualistic interactions between ants and aphids were stronger for Chaitophorus vitellinae than for Pterocomma species. 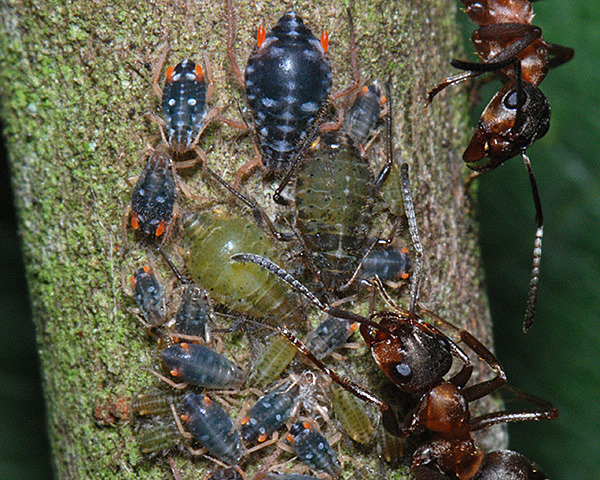 Collins & Leather (2007) investigated the role of the ants in the interaction with Pterocomma salicis following a chance observation of Lasius niger carrying a third instar aphid in its jaws away from an established colony and depositing it on another host plant. They first demonstrated that attendance by ants clearly benefited the aphids, doubling the number of aphids in atended colonies. They then showed that aphid numbers increased faster on the high quality host with ants, partly as a result of the ants moving aphids from one host to the other. 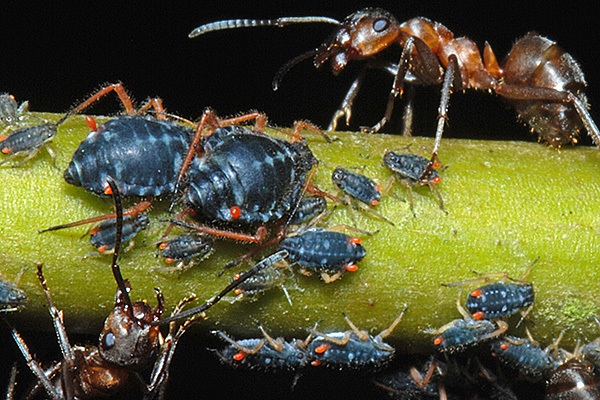 It was concluded that the ants could detect host plant quality via the nutritional level of the honeydew produced by the aphids. Pterocomma salicies is not an obligate myrmecophile, and sometimes (especially when Pterocomma pilosum is not present), there are no ants attending the colony. The picture below is of a large unattended colony. One result of the lack of attending ants is the accumulation of many large droplets of honeydew (see picture below). As a result, the colony was attracting much attention from other honeydew feeders - especially wasps, mainly Vespula species. This picture of a large colony, taken in September, also appears to show a male moving over the other aphids looking for a feeding ovipara to mate. If we are corrrect in thinking this is a male, it is smaller than the feeding females and has much fainter white markings. We have only found syrphid larvae in aphid colonies where there were no ants in attendance. The large larva in the first picture below, which is feeding in a mixed species colony of Pterocomma pilosum and Pterocomma salicis, is probably the syrphid Didea fasciata. The adults of this species are found in woodland, where males aggressively defend sunlit patches. 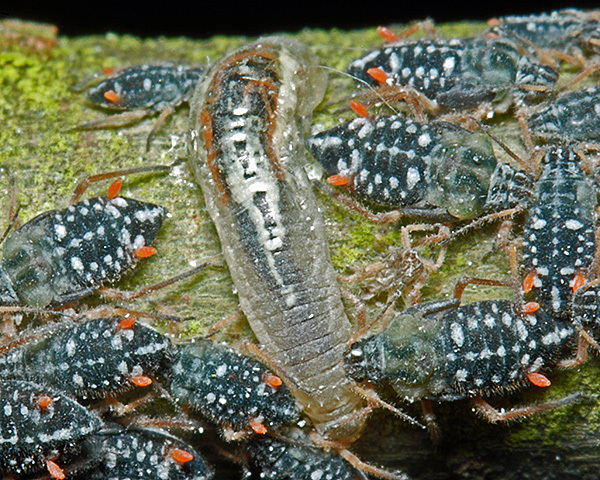 The larvae are found in aphid colonies on both coniferous & deciduous trees. The syrphid larva in the second picture above is most likely Syrphus ribesii. 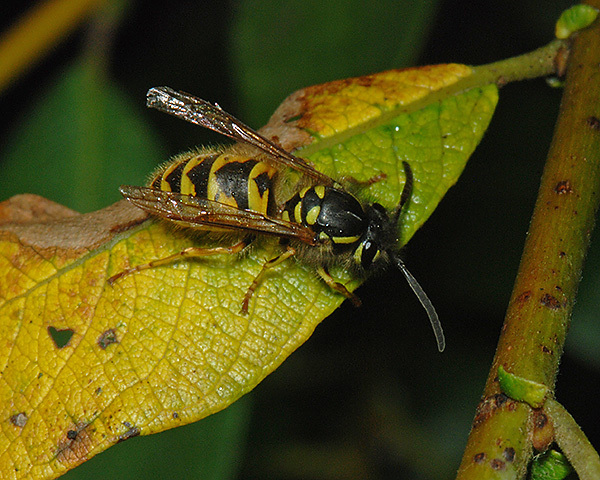 Bagachanova (1990) recorded larvae of a number of species of Syrphidae feeding on Pterocomma species including Scaeva pyrastri, Didea alnetim, Metasyrphus nitens, Syrphus ribesii and Syrphus vitripennis. Sipura (2002) looked at the effects of two ant species Myrmica rubra and Formica aquilonia on the growth of two different willow species. He felt that that Pterocomma salicis was almost completely dependent on the attendance provided by ants. The ant-tended Pterocomma salicis was very abundant on both willow species leading to a strong negative impact of ants on willows. 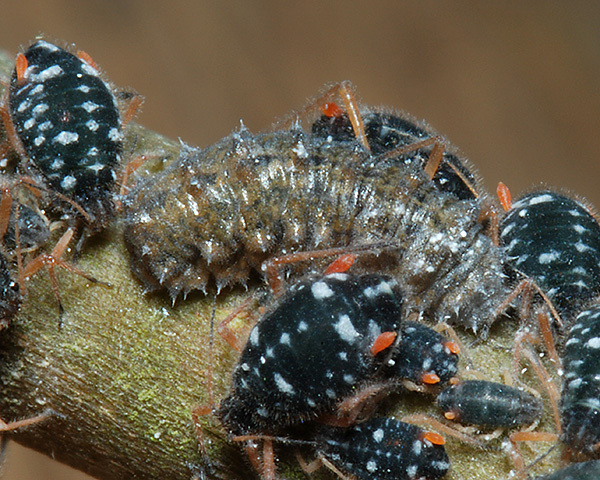 The most obvious benefit obtained by the aphids was the protection against natural enemies. The number of generalist predators increased when ants were excluded, and predatory larvae of syrphid flies were never found in the aphid colonies that ants were tending. 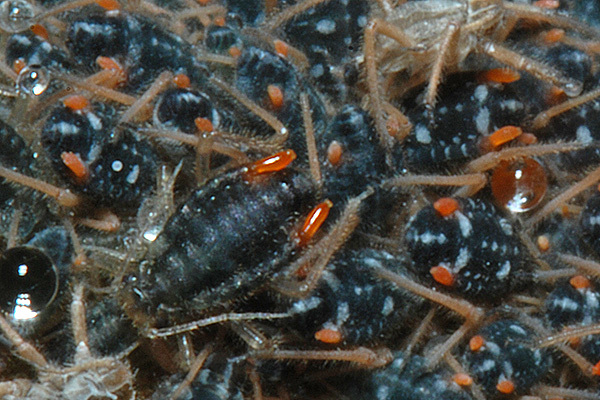 We have found much less evidence for the presence of ants affecting the level of parasitism, and have found mummified parasitized aphids (see picture above) in both attended and unattended aphid colonies. Rakhshani et al. (2007) gives Aphidius cingulatus as a specific parasitoid of Pterocomma species, and this may well be the parasitoid (so far unidentified) that we found. Pterocomma salicis has been recorded on about 32 Salix species. Kearns (1935) suggested using nicotine spray against Pterocomma aphids. However, Collins et al. (2001) has shown that control may not be necessary for this aphid species. Pterocomma salicis did have some negative effects on the growth of roots and shoots during infestation, but the influence of this species did not persist, nor did it influence previous growth. This was in sharp contrast to the effects of Tuberolachnus salignus infestation which had negative effects on the shoots and roots of established and establishing trees, as well as reducing the survival of infested trees.